A shepherd's dog had a master who took no care of him, but often let him suffer the greatest hunger. At last he could bear it no longer; so he took to his heels, and off he ran in a very sad and sorrowful mood. On the road he met a sparrow that said to him, 'Why are you so sad, my friend?' 'Because,' said the dog, 'I am very very hungry, and have nothing to eat.' 'If that be all,' answered the sparrow, 'come with me into the next town, and I will soon find you plenty of food.' So on they went together into the town: and as they passed by a butcher's shop, the sparrow said to the dog, 'Stand there a little while till I peck you down a piece of meat.' So the sparrow perched upon the shelf: and having first looked carefully about her to see if anyone was watching her, she pecked and scratched at a steak that lay upon the edge of the shelf, till at last down it fell. Then the dog snapped it up, and scrambled away with it into a corner, where he soon ate it all up. 'Well,' said the sparrow, 'you shall have some more if you will; so come with me to the next shop, and I will peck you down another steak.' When the dog had eaten this too, the sparrow said to him, 'Well, my good friend, have you had enough now?' 'I have had plenty of meat,' answered he, 'but I should like to have a piece of bread to eat after it.' 'Come with me then,' said the sparrow, 'and you shall soon have that too.' So she took him to a baker's shop, and pecked at two rolls that lay in the window, till they fell down: and as the dog still wished for more, she took him to another shop and pecked down some more for him. When that was eaten, the sparrow asked him whether he had had enough now. 'Yes,' said he; 'and now let us take a walk a little way out of the town.' So they both went out upon the high road; but as the weather was warm, they had not gone far before the dog said, 'I am very much tired--I should like to take a nap.' 'Very well,' answered the sparrow, 'do so, and in the meantime I will perch upon that bush.' So the dog stretched himself out on the road, and fell fast asleep. Whilst he slept, there came by a carter with a cart drawn by three horses, and loaded with two casks of wine. The sparrow, seeing that the carter did not turn out of the way, but would go on in the track in which the dog lay, so as to drive over him, called out, 'Stop! stop! Mr Carter, or it shall be the worse for you.' But the carter, grumbling to himself, 'You make it the worse for me, indeed! what can you do?' cracked his whip, and drove his cart over the poor dog, so that the wheels crushed him to death. 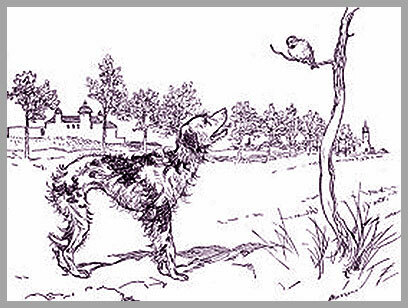 'There,' cried the sparrow, 'thou cruel villain, thou hast killed my friend the dog. Now mind what I say. This deed of thine shall cost thee all thou art worth.' 'Do your worst, and welcome,' said the brute, 'what harm can you do me?' and passed on. But the sparrow crept under the tilt of the cart, and pecked at the bung of one of the casks till she loosened it; and than all the wine ran out, without the carter seeing it. At last he looked round, and saw that the cart was dripping, and the cask quite empty. 'What an unlucky wretch I am!' cried he. 'Not wretch enough yet!' said the sparrow, as she alighted upon the head of one of the horses, and pecked at him till he reared up and kicked. When the carter saw this, he drew out his hatchet and aimed a blow at the sparrow, meaning to kill her; but she flew away, and the blow fell upon the poor horse's head with such force, that he fell down dead. 'Unlucky wretch that I am!' cried he. 'Not wretch enough yet!' said the sparrow. And as the carter went on with the other two horses, she again crept under the tilt of the cart, and pecked out the bung of the second cask, so that all the wine ran out. When the carter saw this, he again cried out, 'Miserable wretch that I am!' But the sparrow answered, 'Not wretch enough yet!' and perched on the head of the second horse, and pecked at him too. The carter ran up and struck at her again with his hatchet; but away she flew, and the blow fell upon the second horse and killed him on the spot. 'Unlucky wretch that I am!' said he. 'Not wretch enough yet!' said the sparrow; and perching upon the third horse, she began to peck him too. The carter was mad with fury; and without looking about him, or caring what he was about, struck again at the sparrow; but killed his third horse as he done the other two. 'Alas! miserable wretch that I am!' cried he. 'Not wretch enough yet!' answered the sparrow as she flew away; 'now will I plague and punish thee at thy own house.' The carter was forced at last to leave his cart behind him, and to go home overflowing with rage and vexation. 'Alas!' said he to his wife, 'what ill luck has befallen me! --my wine is all spilt, and my horses all three dead.' 'Alas! husband,' replied she, 'and a wicked bird has come into the house, and has brought with her all the birds in the world, I am sure, and they have fallen upon our corn in the loft, and are eating it up at such a rate!' Away ran the husband upstairs, and saw thousands of birds sitting upon the floor eating up his corn, with the sparrow in the midst of them. 'Unlucky wretch that I am!' cried the carter; for he saw that the corn was almost all gone. 'Not wretch enough yet!' said the sparrow; 'thy cruelty shall cost thee they life yet!' and away she flew. The carter seeing that he had thus lost all that he had, went down into his kitchen; and was still not sorry for what he had done, but sat himself angrily and sulkily in the chimney corner. But the sparrow sat on the outside of the window, and cried 'Carter! thy cruelty shall cost thee thy life!' With that he jumped up in a rage, seized his hatchet, and threw it at the sparrow; but it missed her, and only broke the window. The sparrow now hopped in, perched upon the window- seat, and cried, 'Carter! it shall cost thee thy life!' Then he became mad and blind with rage, and struck the window-seat with such force that he cleft it in two: and as the sparrow flew from place to place, the carter and his wife were so furious, that they broke all their furniture, glasses, chairs, benches, the table, and at last the walls, without touching the bird at all. In the end, however, they caught her: and the wife said, 'Shall I kill her at once?' 'No,' cried he, 'that is letting her off too easily: she shall die a much more cruel death; I will eat her.' But the sparrow began to flutter about, and stretch out her neck and cried, 'Carter! it shall cost thee thy life yet!' With that he could wait no longer: so he gave his wife the hatchet, and cried, 'Wife, strike at the bird and kill her in my hand.' And the wife struck; but she missed her aim, and hit her husband on the head so that he fell down dead, and the sparrow flew quietly home to her nest.